Heel pain is generally the result of faulty biomechanics (walking gait abnormalities) that place too much stress on the heel bone and the soft tissues that attach to it. The stress may also result from injury, or a bruise incurred while walking, running, or jumping on hard surfaces; wearing poorly constructed footwear; or being overweight. The heel bone is the largest of the 26 bones in the human foot, which also has 33 joints and a network of more than 100 tendons, muscles, and ligaments. Like all bones, it is subject to outside influences that can affect its integrity and its ability to keep us on our feet. Heel pain, sometimes disabling, can occur in the front, back, or bottom of the heel. If you develop heel pain, you can try several methods at home to ease your discomfort. For example rest as much as possible, apply ice to the heel for 10 to 15 minutes twice a day, use over-the-counter pain medications, wear shoes that fit properly, wear night splints, a special device that stretches the foot while you sleep, use heel cups or shoe inserts to reduce pain, If these home care strategies do not ease your pain, you will need to see your doctor. He or she will perform a physical exam and ask you about your symptoms and when they began. Your doctor may also take an X-ray to determine the cause of your heel pain. Once your doctor knows what is causing your pain, he or she will be able to provide you with the appropriate treatment. In many cases, your doctor may prescribe physical therapy. This can help to strengthen the muscles and tendons in your foot, which helps to prevent further injury. If your pain is severe, your doctor may provide you with anti-inflammatory medications. These medications can be injected into the foot or taken by mouth. Your doctor may also recommend that you support your foot as much as possible-either by taping the foot or by using special footwear devices. In very rare cases, your doctor may recommend surgery to correct the problem. However, heel surgery often requires a long recovery time and may not always relieve your foot pain. A person with flat feet (fallen arches) has low arches or no arches at all. Most cases don't cause problems and treatment isn't usually needed. The arch, or instep, is the inside part of the foot that's usually raised off the ground when you stand, while the rest of the foot remains flat on the ground. Most people have a noticeable space on the inner part of their foot (the arch). The height of the arch varies from person to person. Wearing shoes that are too tight can make the pain of Morton's neuroma worse. This is because the toe bones are more likely to press on the affected nerve if your shoes are too tight. High-heeled shoes, particularly those over 5cm (2 inches), or shoes with a pointed or tight toe area, can also compress your toes and make the pain worse. This is why women tend to be affected by Morton's neuroma more than men. The most common presenting complaints include pain and dysesthesias in the forefoot and corresponding toes adjacent to the neuroma. Pain is described as sharp and burning, and it may be associated with cramping. Numbness often is observed in the toes adjacent to the neuroma and seems to occur along with episodes of pain. Pain typically is intermittent, as episodes often occur for minutes to hours at a time and have long intervals (ie, weeks to months) between a single or small group of multiple attacks. Some patients describe the sensation as "walking on a marble." Massage of the affected area offers significant relief. Narrow tight high-heeled shoes aggravate the symptoms. Night pain is reported but is rare. There are actually not one but two different types of leg length discrepancies, congenital and acquired. Congenital indicates you are born with it. One leg is anatomically shorter in comparison to the other. As a result of developmental phases of aging, the brain picks up on the stride pattern and identifies some variation. Our bodies typically adapts by tilting one shoulder over to the "short" side. A difference of less than a quarter inch is not grossly irregular, doesn't need Shoe Lifts to compensate and typically does not have a profound effect over a lifetime. Leg length inequality goes typically undiscovered on a daily basis, yet this problem is simply solved, and can reduce many cases of back problems. Therapy for leg length inequality commonly involves Shoe Lifts. Many are very inexpensive, normally costing less than twenty dollars, in comparison to a custom orthotic of $200 if not more. When the amount of leg length inequality begins to exceed half an inch, a whole sole lift is generally the better choice than a heel lift. This prevents the foot from being unnecessarily stressed in an abnormal position. Chronic back pain is easily the most prevalent condition impacting people today. Around 80 million people experience back pain at some stage in their life. It is a problem which costs companies huge amounts of money every year on account of lost time and production. New and more effective treatment solutions are continually sought after in the hope of minimizing the economical influence this issue causes. Men and women from all corners of the world suffer the pain of foot ache due to leg length discrepancy. In these types of cases Shoe Lifts are usually of very helpful. The lifts are capable of reducing any pain and discomfort in the feet. Shoe Lifts are recommended by countless specialist orthopaedic practitioners". So as to support the human body in a balanced fashion, feet have got a very important function to play. In spite of that, it's often the most overlooked area of the human body. Many people have flat-feet meaning there may be unequal force placed on the feet. This will cause other areas of the body including knees, ankles and backs to be affected too. Shoe Lifts make sure that the right posture and balance are restored. There are two different kinds of leg length discrepancies, congenital and acquired. Congenital means you are born with it. One leg is anatomically shorter than the other. Through developmental phases of aging, the brain picks up on the gait pattern and identifies some variance. The human body typically adapts by dipping one shoulder over to the "short" side. A difference of less than a quarter inch is not blatantly excessive, demand Shoe Lifts to compensate and commonly doesn't have a serious effect over a lifetime. Leg length inequality goes largely undiscovered on a daily basis, however this condition is easily remedied, and can eradicate numerous instances of back pain. Treatment for leg length inequality usually consists of Shoe Lifts. Most are economical, regularly costing under twenty dollars, in comparison to a custom orthotic of $200 and up. Differences over a quarter inch can take their toll on the spine and should probably be compensated for with a heel lift. In some cases, the shortage can be so extreme that it requires a full lift to both the heel and sole of the shoe. Lower back pain is the most widespread condition impacting men and women today. Over 80 million men and women are afflicted by back pain at some stage in their life. It's a problem that costs businesses vast amounts of money every year due to time lost and production. Fresh and better treatment solutions are continually sought after in the hope of minimizing the economical impact this condition causes. People from all corners of the earth suffer the pain of foot ache as a result of leg length discrepancy. In most of these cases Shoe Lifts are usually of very beneficial. The lifts are capable of easing any pain in the feet. Shoe Lifts are recommended by many specialist orthopaedic physicians. In order to support the body in a healthy and balanced fashion, the feet have got a crucial function to play. Despite that, it can be the most neglected zone of the human body. Some people have flat-feet meaning there is unequal force placed on the feet. This will cause other areas of the body such as knees, ankles and backs to be impacted too. Shoe Lifts guarantee that appropriate posture and balance are restored. The condition is more common in young people active in sport, and boys are more frequently affected than girls. One study found the average age of presentation was around 12 years for boys and 9 years for girls. In one prospective study of injuries among players aged 9-19 years in football academies, 2% of overall football injuries were due to Sever's disease; the peak for incidence was in the under-11 age group. In a study of 85 children, the condition was bilateral in 61%. Sever?s disease treatment should be based on eliminating pain and restoring normal foot and leg biomechanics. As with most soft tissue injuries the initial treatment is Rest, Ice, and Protect. In the early phase you?ll most likely be unable to walk pain-free. Our first aim is to provide you with some active rest from pain-provoking activities. "No Pain. No Gain." does not apply in Sever's disease. If it hurts your child is doing too much exercise. Your child should reduce or cease any activity that causes heel pain. Ice is a simple and effective modality to reduce your pain and swelling. Please apply for 20-30 minutes each 2 to 4 hours during the initial phase or when you notice that your injury is warm or hot. Most children can tolerate paracetamol as a pain reducing medication. Check with your doctor. To support and protect your heels, you may need to be wear shock absorbing heel cups or a soft orthotic. Kinesio foot taping may help to provide pain relief. What Can cause Adult Aquired Flat Feet ? For those patients with PTTD that have severe deformity or have not improved with conservative treatments, surgery may be necessary to return them to daily activity. Surgery for PTTD may include repair of the diseased tendon and possible tendon transfer to a nearby healthy tendon, surgery on the surrounding bones or joints to prevent biomechanical abnormalities that may be a contributing factor or both. 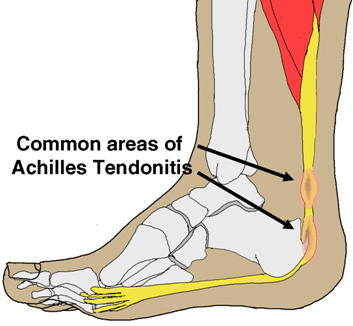 What Can We Do About Achilles Tendonitis ? Some of the causes of Achilles tendonitis include, overuse injury - this occurs when the Achilles tendon is stressed until it develops small tears. Runners seem to be the most susceptible. People who play sports that involve jumping, such as basketball, are also at increased risk. Arthritis - Achilles tendonitis can be a part of generalised inflammatory arthritis, such as ankylosing spondylitis or psoriatic arthritis. In these conditions, both tendons can be affected. Foot problems - some people with flat feet or hyperpronated feet (feet that turn inward while walking) are prone to Achilles tendonitis. The flattened arch pulls on calf muscles and keeps the Achilles tendon under tight strain. This constant mechanical stress on the heel and tendon can cause inflammation, pain and swelling of the tendon. Being overweight can make the problem worse. Footwear - wearing shoes with minimal support while walking or running can increase the risk, as can wearing high heels. Overweight and obesity - being overweight places more strain on many parts of the body, including the Achilles tendon. Quinolone antibiotics - can in some instances be associated with inflammatory tenosynovitis and, if present, will often be bilateral (both Achilles), coming on soon after exposure to the drug. There is enlargement and warmth of the tendon 1 to 4 inches above its heel insertion. Pain and sometimes a scratching feeling may be created by gently squeezing the tendon between the thumb and forefinger during ankle motion. There may be weakness in push-off strength with walking. Magnetic resonance imaging (MRI) can define the extent of degeneration, the degree to which the tendon sheath is involved and the presence of other problems in this area, but the diagnosis is mostly clinical. Many people don't realize that Achilles tendon surgery can be very traumatic to your body. The type of trauma you experience after surgery can be compared to what you go through when you first injured your Achilles tendon. During the first 24 to 72 hours after the surgery your ankle will be tender, swollen and very painful. Your leg will be weak and unstable making it impossible for you to put weight on your leg without some kind of help. This is why your doctor or surgeon will have you outfitted for a cast, ankle brace and/or crutches before the procedure. When you are relying on a cast/brace and crutches your Achilles tendon is less likely to be as active as it once was. This is usually why atrophy (loss) of your lower leg muscles (specifically your calf muscle) happens. In general, more than 80%* of people who undergo surgery for an injured Achilles Tendon are able to return to their active lifestyle. In order to avoid re-injury, it is important to commit to a regular conservative therapy routine. The Achilles tendon is situated above the heel and forms the lower part of the calf muscles. It is a continuation of the two calf muscles, the gastrocnemius and soleus muscles, and it attaches to the heel bone. It is the strongest tendon in the human body and must withstand great forces. Its function is to transmit the force produced by the calf muscles to lift the heel and produce the push off during walking, running and jumping. The Achilles can produce force of up to seven times body weight. This shows just how much force it has to withstand during sporting activities, such as sprinting, jumping and turning. You may notice the symptoms come on suddenly during a sporting activity or injury. You might hear a snap or feel a sudden sharp pain when the tendon is torn. The sharp pain usually settles quickly, although there may be some aching at the back of the lower leg. After the injury, the usual symptoms are a flat-footed type of walk. You can walk and bear weight, but cannot push off the ground properly on the side where the tendon is ruptured. Inability to stand on tiptoe. If the tendon is completely torn, you may feel a gap just above the back of the heel. However, if there is bruising then the swelling may disguise the gap. If you suspect an Achilles tendon rupture, it is best to see a doctor urgently, because the tendon heals better if treated sooner rather than later. A person with a ruptured Achilles tendon may experience one or more of the following. Sudden pain (which feels like a kick or a stab) in the back of the ankle or calf, often subsiding into a dull ache. A popping or snapping sensation. Swelling on the back of the leg between the heel and the calf. Difficulty walking (especially upstairs or uphill) and difficulty rising up on the toes.